Specially formulated and waterproof to hold lashes securely and comfortable day after day. 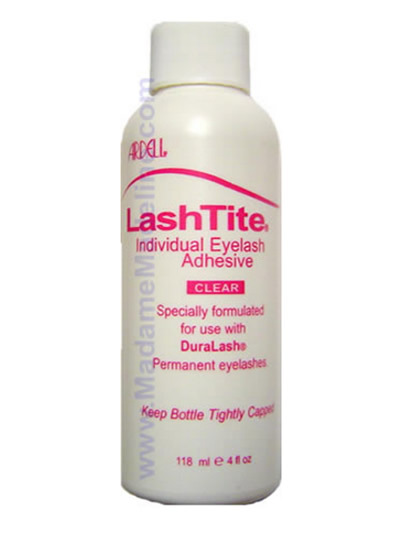 LashTite Adhesive (professional salon size 4.0 oz) is designed for use with DuraLash individual lashes. This adhesive is specially formulated to ensure that Duralash and Permalash remain securely and comfortably attached, day after day for up to 6 weeks. LashTite glue 4.0 oz is available in Clear tone only. LashTite in 4.0 oz has been discontinued and is no longer available. LashTite Adhesive is now available in 1/8 and 3/4oz and in salon size Ardell 2.0 oz. Directions: Clean your own lashes with non-oily makeup remover or soap and water. Dip the end of the individual lash in adhesive, then place it slowly onto your own lashes, as close your lashline as possible. Press gently for a few seconds until dry. Continue same method for each lash used. For additional help, please click here for step-by-step directions. Caution: Keep away from children. Use only as directed. Avoid getting into eyes. If contact occurs, wash immediately with lukewarm water. lashes will be going nowhere. Your lashes will definitely not be falling off with this glue. One of the best individual lash glues I have ever used. A tiny bit goes a long way with this one! Used this product for many years, this makes your lashes stay on for a long time. I recommend this for flare cluster lashes and or individual lashes. I love this stuff. I really love the way it dries, also has a really long lasting hold. Good glue indeed. I wasn't too excited to try this product but I go it to check it out because a friend who uses it swears it was the best. I will say Im very happy with my purchase of this glue. Held me lashes on for almost 2 1/2 weeks. Dries quick and clear. Effective as expected. Its actually an ok product. does the job well. Got it fast and really happy with it. Got a good deal for this glue and arrived fast. Works really really good.